The Eyde brothers continued writing each other long after the end of the war. 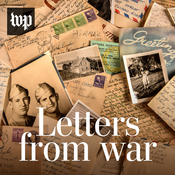 In their letters over the next decades, it’s clear that their experiences in the war changed the course of their lives in dramatic, and in very different, ways. The voice actors join Dan to discuss the second half of the story, and how those in the armed services are shaped by their experiences with war. Back at home, Ralph and Frank struggle to recover and readjust to civilian life. Meanwhile, as the Allies move towards victory, John’s role in the war is just about to begin. Frank has seen his first combat, as Ralph and John prepare for their own deployments. Facing war has the brothers engaged in intense battles -- both physical and mental. The actors in this podcast are all veterans themselves. They join Dan to discuss their experiences reading the letters, and what is universal about the story of the Eyde family.